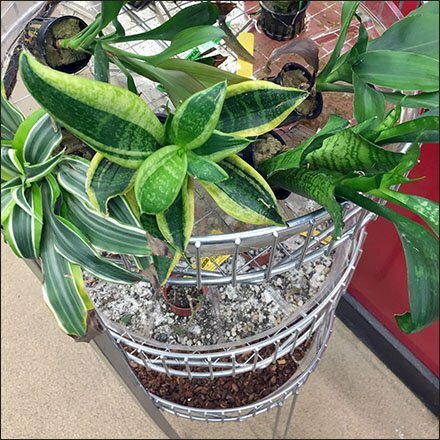 Why waste perfectly good End-Aisle space when you can sell from it using Circular Open Wire Tower For Aquarium Plants like this. Te circular shape helps guide aisle traffic around the Tower, but would also make it useful displaying in all directions in larger spaces or mid-Power-Aisle use. Here the three tiers merchandise Plant offerings for Terreriums, Aquariums, and such. Browse the tower in the Circular Open Wire Tower For Aquarium Plants gallery of images. Note the extra “anti-tip” Open Wire Legs for added stability. Seen at Petco.